Corrected some problems and switched to the Rayleigh IDT algorithm. Still can't tell that it does anything worthwhile. Playing with this and looking at it I realize that though it is time correct it is not amplitude correct. When an acoustic source is moved to the "far" left the amplitude at the right microphone dose not drop to zero or anything like it. Thus the HRTFs must have a dominant role in in localization. 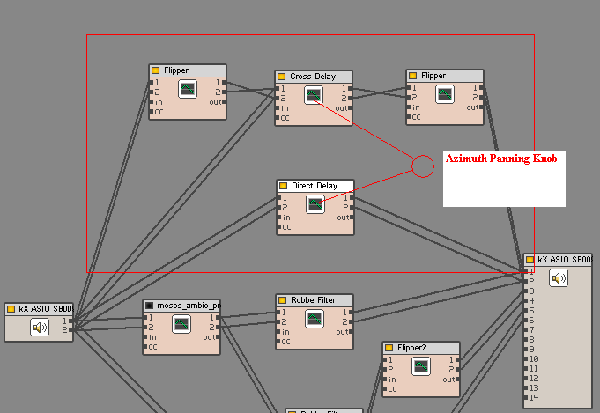 I think at this point I will abandon this and look at VST in c++ so I can play with adding HRTFs in the pan path. What I want ultimately is something that models the ambiophonic recording method. If anyone can point to help with such it would be appreciated. Give these a shot. Might be more ambiosonic related but they should share similarities? They have the VST code I believe as well. Thanks for the link. These are interesting technologies. However the panner does seem to be for ambiosonics which is for multi-channel (>2) systems What I want is one that enhances both ambiophonic and (I think) therefore std. stereo playback. I was discussing this with mosc and he suggested to post about it here. First a little background theory to help explain my idea, bear with me. A little something I put together showing a single source of sound location around a head. This will should you how azimuth angle can change the time difference between the two ears. Notice how different head diameters can create different time differences. The equation is taken from one of the papers I read. Note: negative time indicates switch over from L-R to R-L. The 5 and 10deg numbers are an important set of numbers for an ambiophonics playback system. Ok moving on, sorry for more long text to read. Typical panning knobs in stereo are not totally correct since our hearing relies mostly on Time diffences <1.5Khz. When you attempt to use a typical amplitude panner for ambiophonics, it doesn't work right since width will be lost and you will only be albe to pan +/-15 deg. The problem is that by using amplitude you kill off the cancelation that is allowing you to have width, so it locks the image to whatever side you pan it to. This is the same problem with pan-pot stereo as well IMO, but not as bad because the speakers are at least spaced out more so it is less noticeable. For closely spaced stereo dipole/ambiophonic setups, this is noticed even more. The image should be allowed to move beyond the speaker, otherwise you end up with opposite effect you should get by panning and end up with a mono source trapped at the speaker right? Not good IMO. I suggested this in mosc's ambiophonic VST thread, and decided to try a quick experiment to see if this would work by adding another delay on the direct signal. If you have two sources + two ears, you have 4 paths. In order to truly pan by azimuth angle, you have to compensate for all 4 paths/delays. See my attached diagram. You can't have a negative delay, so you would have to add/pad additional delay to allow for maximum panning so add an additional 60-80us to all signals. I used a generic 20us value for my examples, but that is not totally correct. Maybe later I will try to work out the real math. Also, there would have to be some type of gain/amplitude adjustment that gradually comes in towards the higher frequencies based on ITD to ILD switch over. Ideally, you would tie this to one knob that adjusted all parameters at once-I call it an "azimuth panning knob" as that makes the most sense to me. I can test it by manually setting the values just like above and it seems to work, but I cannot test this variably. Does this make any sense? Is it possible to make a plugin that does this? There is an ambisonic VST that does something similar to this for surround that is a rotate/tumble/tilt that works kind of similar to this on the York website. I'm attaching my crude idea minus amplitude/gain compensation. It's basically mosc's MAP + additional delay block to allow time correct panning. Can this be made into a VST of sorts? Typical panning knobs in stereo are not totally correct since our hearing relies mostly on Time diffences <1.5Khz. This is kind of tangential but the relative importance of time delay vs. HRTFs is not clear to me. Do you have any links to empirical or other evidence/studies for this. Are you asking if I have come across a study that indicates ITD is the only important factor? No, this I have not. ITD and ILD are both important parts of HRTF's so yes, HRTF is better way to describe it since it covers more bases. I'm suggesting for horizontal azimuth panning, ITD is important I didn't mean for my statement to be so general. The time/intensity trading is a gradual thing but if we generalized it and said which are more dominant, for most of the information available according to Raleigh's duplex theory. Of further note, my understanding of ILD for us is mainly used for elevation. In ambiophonics where we have two closely spaced speakers, a panning device only based on level adjustment is going to cause hard left panned material to only reside at the left speaker (5-10deg), and hard panned right material will reside at the right speaker (5-10deg) because we won't have the cross-cancelation to "throw" the source out of bounds. My experimenting with my crude panning concept above seems to prove this to me unless I am doing something grossly wrong. 2) "Shift" the entire stage left or right using ambiophonics. Also, we are completely neglecting the effects of the room itself which have a huge impact on how successful any of this is. With ambiophonics the speakers are more centrally located and farther away from side walls that can ruin stage width. In stereo the speakers are farther apart, and if proper steps are not taken to minimize side wall reflections or at least delay them enough, then the width will suffer. Partly but more sleazily I was hoping for some thing that was sufficiently detailed that I could implement full HRTF algorithms from it. Hmmm, well I've seen curves, impulses, all sorts of things but they are all still approximations. I don't think an accurate easy model exsists. Google HRTF models and you will get lots of different methods. I've heard of systems that utilize a laser tracker and switches impulses in real-time to location of the head, but outside of virtual reality and/or headphone users I'm not sure too many people would want to wear such a contraption. HRTF models suffer from some of the same problems digital room correction do. The room interaction. I had come under the (uncertain) impression that for panning HRTF FR curves were of secondary importance after amplitude and that the shape of an individual’s pinna determinative for those curves. And that the pinna shape could be broken down into something like 16 morphological approximations, one of which would almost certainly “fit” any given individual. And that this dependence of the HRTF FR curve on the individual’s pinna shape “class” was the major stumbling block for improved panning (ambiophonic or otherwise). And that inter aural time delay issues were tertiary. Is this not correct? Very interesting. I have to honestly say this is new info to me. I cannot say if I believe it is right or wrong. Do you have a source that discusses this? I would love to read about it. By altering the timing of certain signals, would you agree it can affect amplitude (for various frequencies depending on combfiltering), which could also affect HRTF's. The question is, does this effect create the right result? So is this what you are describing? I'll need to read this several times. Looks like an excellent link, and many thanks for it.